The lovely people down at WCDP (West Cork Development Partnership) in Clonakilty, have just announced an all-new Tech Conference called OFFSITE. I’m really pleased they are doing this, and not just because I’m one of the speakers. There is a huge amount of tech activity happening in Munster but all of those companies rarely get a chance to meet and share ideas, knowledge or problems. OFFSITE aims to get us all in the one place for a day and do exactly that. In addition to great speakers like Jerry Kennelly, John Dennehy, Donal Cahalane and Ger Keohane, they are also experimenting with a BarCamp session where anyone can offer to speak on anything in the tech sphere. Like all BarCamps, no self-pimpage will be allowed. The other great aspect of the event is cost. Not €1900, not €900, it’s just €40 to cover those bits that WCDP isn’t allowed to sponsor. That includes lunch and coffee breaks. Head on over and register. It’s on Thursday 27 September in the Celtic Ross Hotel, Rosscarbery, just a few miles from Clonakilty. I hope we see people from across the country attending. This could be the start of something special. I just found out the details of the Techovate conference that is on in Wexford Opera House next Wed/Thu. It’s about the intersection of technology and business, a subject dear to my heart. You’ll hear from execs in Microsoft, Google, IBM, Facebook, CISCO, LinkedIn and others. More importantly, unlike some other conferences, you’ll actually get to talk and network with them. The programme is jam packed and covers a wide range of topics. Plenty of learning and sharing to be had. A one day ticket is only €175, which is a bargain compared to a lot of the event gouging that is going on at the moment. FeedHenry has just announced a new platform in partnership with VMware’s Cloud Foundry and it’s pretty awesome. The addition of Cloud Foundry is a huge win for the Waterford-based company. Now you build your Apps as usual but deploy the server part to the extremely impressive Cloud Foundry infrastructure. It makes use of Cloud Foundry’s Node.js support and you can deploy with the FHC command line or in the browser-based Studio GUI. 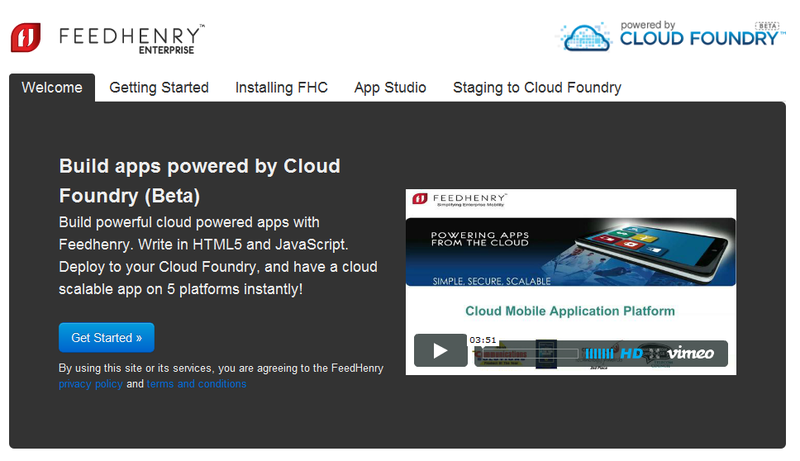 I’ve been a big fan of FeedHenry for a long time and also a fan of Cloud Foundry since it launched. It’s like your two favourite people getting engaged. Now to find the time to build something using both! A big thank you to Paul O’Mahony for doing these at #twittertd and apologies for the delay in posting them here. Lots of great stuff to listen to. The Irish Software Developer Network (ISDN – love it!) is running an event this Thursday all about automated web testing. In this talk, John Ferguson Smart will look at the advantages of using Selenium 2/WebDriver for your web tests, and see what Thucydides brings to the party. It kicks off at 6.30pm at the TCube, 32-34 Castle St, Dublin. Free beer and pizza too. All the details and info about the live stream over on IrishDev. I heard about Dubin Startup Weekend at Twitter Teatime this week and Ma?gorzata Hrasimowicz has sent on the details. The idea behind the Startup Weekends is to get a broad mix of developers, designers, marketers, biz people etc to work together and turn ideas into a workable business in 2 days. It’s a non-profit org based in Seattle and they have had weekends like this all over the world. All the deets are over on the website. Head on over and register, it looks like it’ll be a fab couple of days and it’s on in the cool Google offices. Tea Time is a weekly staff meeting held at Twitter offices on Friday afternoons. Every Friday the company gets together, greets new hires, talk about what happened that week and take Q&A. Anyone in the company can talk about what they did that week. Over the past couple of months, Twitter have expanded outside the office and hosted a series of events for developers in the Twitter ecosystem. There’s a lot going on in the ecosystem and it’s a chance to share the highlights with developers – including the latest developments with the platform, areas of demand within the ecosystem, and technical dives into integration opportunities for developers. Thursday, February 23rd will see see Ireland hosting it’s first teatime event, Teatime Dublin. On the agenda will be a couple of talks by Irish startups who are currently working on interesting applications of the various Twitter API’s, followed by a Q&A with the platform team from Twitter San Francisco who will be joining the proceedings via the magic of SKYPE. Its a great opportunity to meet other developers and also get a chance to put any tricky questions directly to the platform team. You can sign up right here on twitter.com. Places are limited. Healthbox, the Chicago-based accelerator program for health care startups has selected 10 companies to participate in its three-month program and the line-up includes Irish PaJR (Patient Journey Record). PaJR is using Trinity College developed technology to build a cloud-based hospital re-admissions prevention platform. The software identifies at-risk patients based on health status information reported by patients and caregivers. The accelerator program offers each company office space and $50,000 in seed capital, in addition to access to a network of about 70 mentors that includes hospital executives, health care entrepreneurs and venture capitalists. The 10 companies will also work with the five-member Healthbox team. Healthbox received about 200 applications from businesses across the country, in addition to eight applications from international teams.